Captain of the Firefly class vessel Serenity, Malcolm Reynolds and his diverse crew traverse the black expanse of space taking almost any job that crosses their path. 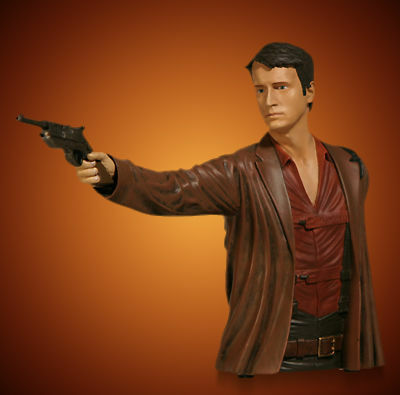 This six-inch bust feature the intrepid rogue with his pistol drawn, ready to take on any who would get in his way! 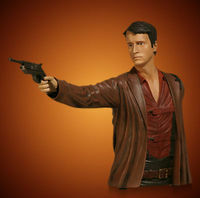 Sculpted by Gentle Giant Studios and limited to 1,000 pieces, this bust is 1/6 scale and stands approximately 6 inches tall. Legal Notice: Entire contents trademarked (® or TM) and copyrighted (©) 1986-2019 by Things From Another World, Inc. and respective copyright and trademark holders. All rights reserved. Page rendered at 2019-04-19 17:38:49 in 0.272 seconds.